This richly detailed documentary illustrates the complex processes utilized by Pomo Indian weavers of northern California to cultivate, manage, harvest, and prepare the indigenous plant materials used in their world-famous baskets. The wealth of time, specialized knowledge, and skills involved in transforming living plants into beautiful woven vessels are underappreciated, though essential components of the basketweaver’s art. 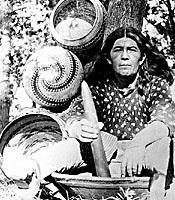 The video also demonstrates, in concrete ways, the often overlooked sophistication of California Indian land use and management and shows how mainstream America’s differing worldviews on land use are endangering the traditional plant materials of the Pomo. “Roots of Beauty” will stimulate discussion in a variety of courses in environmental issues, land use management, cultural anthropology, and Native American studies. It was produced by Jed Riffe and Sherrie Smith-Ferri.